The restaurant Danji is So Good Ruth Reichl wrote a poem about it (it’s on Danji’s site). dazzling tangle of flavors on sweet little buns. And crisp, soft tofu rolls: savory clouds. And it’s all true. When I started this post, I wasn’t planning to write a poem about Danji but I’m glad Mrs. Reichl did (and not just because quoting her makes this post practically write itself). Danji is poem-worthy but the restaurant is on my mind because I’m hungry and Danji’s between my work and my home so when hunger pains ping and the day is closing I find it hard not to walk by and just see …. how long the line is. Along with amazing food from the Traditional or Modern Korean Menu offerings, they make a mean cocktail. I ordered the Spicy Ginger Margarita (hold the spice). It’s balance and refreshing with a ginger bite. If you sit at one of the narrow, family style tables you might even make some friends. The last time we went, we ended up best friends with the women next to us. They were visiting New York City on a Sister Weekend and had just been to a Salsa dance lesson and stumbled upon Danji. We shared our tofu with them, they shared their chicken with us (we got the better end of the deal but I’m not a fan of tofu). So please check out the Danji website here. And please check them out in person. After all, that’s the only way you’ll get the Bulgogi Sliders, Garlic Honey Wings, Danji Braised Short Ribs ….. 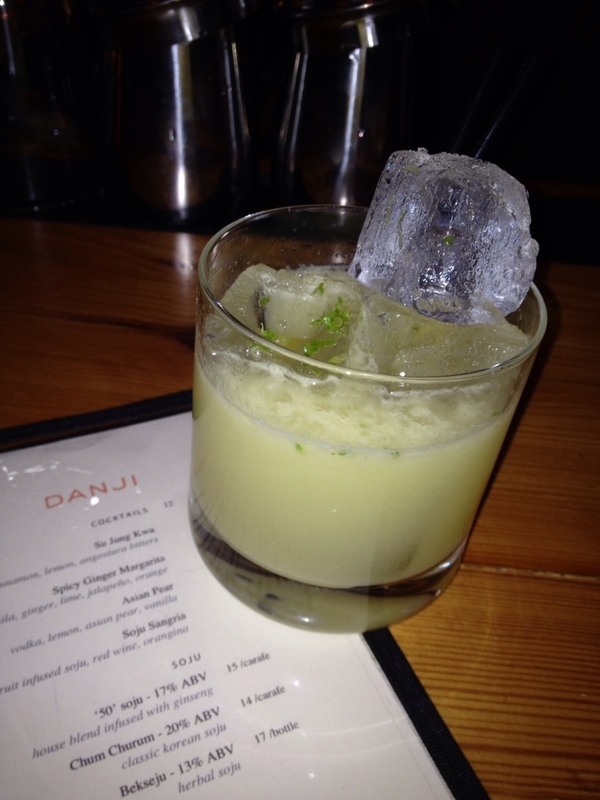 The only thing I don’t like about Danji – Artisanal Ice in the cocktail – But Artisanal Ice is a story for another day.